Post in the comments section below, telling me what you might use my homespun yarn for (it is DK to Chunky weight), and I will put your name in an ice-cream bucket with everyone else who does the same. Hubby will draw the winning name from the bucket. The prize? 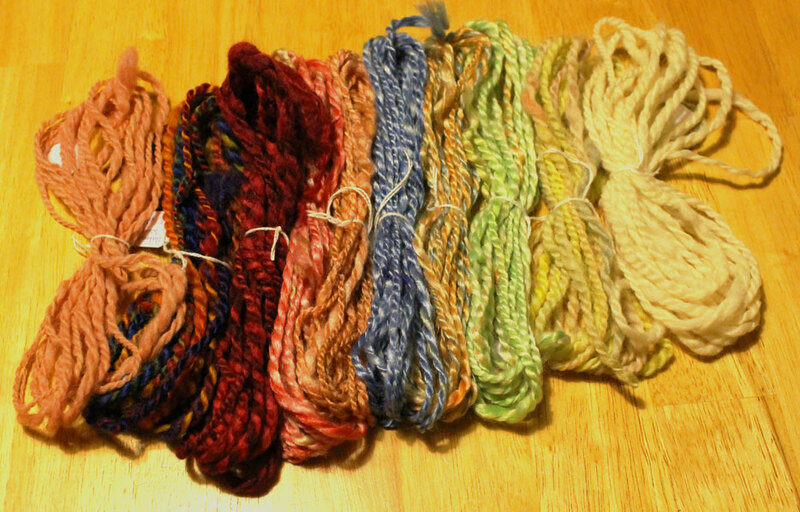 A 5 yard sample of each of 10 yarns I have spun since Wintergreen November 2013. That will be 50 yards of homespun. 🙂 Ideal for hooking into your scenes, whatever they may be. A combination of fibers. Some silk/Tencel (soft and shiny), some BFL (Blue Faced Leicester), some Merino, some silk/Merino, some unknown wool (meaning unlabeled, but feels like Merino or BFL). I have labeled it all for you. For those of you who do not know sheep breeds, Merino and BFL are soft wools normally used in knitting, but I also use them in my hooked wall hangings. Contest runs till midnight, Sunday, January 26th. Winner will be announced Monday, Jan. 27th. Ohh…Noah’s Ark. The blue would be great in the sky. Lots of options for the other colours too. Good idea. Oh my goodness.. This is beautiful!! I would love to work it into anything … That I am making rug, personal piece, IDK anything that I would love to keep in my home! So beautiful!!! Your yarn is so lovely, I would have to design a wall hanging just to highlight it! Maybe a floral. I hook only with yarn so I would use it to hook! Lovely colours! Such lovely handspun yarns!! I would love to see and touch your yarn. I just started spinning. It would help me so much to have a visual. Then I would be able to see if I’m getting the twist right. I’m learning this alone. With books and DVD’s. I’m taking Deanne new class on Abstract Rugs… so these textures would be wonderful in this class. Such gorgeous handspun yarns! I am back to spinning and my goal this year is to spin a sweaters worth of yarn. If I were lucky enough to win, I think I would make a cowl. I can see these beautiful colors in a sunset mat with highlights in the trees. Jean, Congratulations on your 400th post! 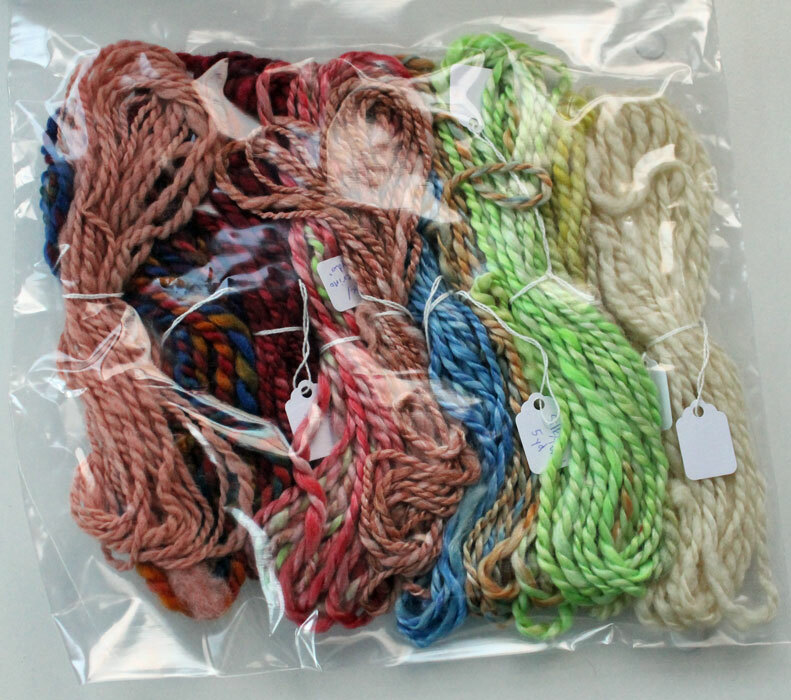 This sampling of your had spun&dyed yarns are a delight to see. Would be great to use these fibers in a future geometric or in a landscape hanging. Would even like to roll them and place them in a bowl to admire them. Thank you for this opportunity.